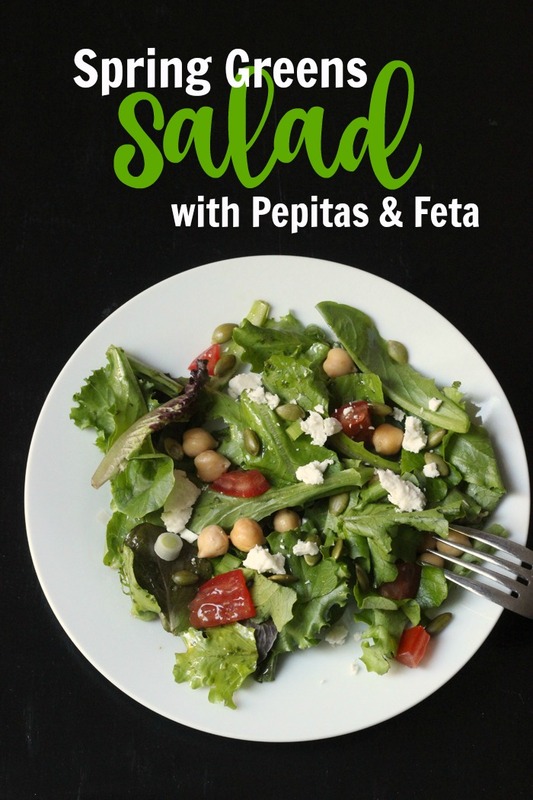 Liven up your nights with a fresh Spring Greens Salad with Pepitas & Feta that is bursting with fresh and vibrant flavors. As the weather starts to warm up, our appetites start to get a hankering for fresh and bright flavors. Move over slow cooker meals, bring on the salads! 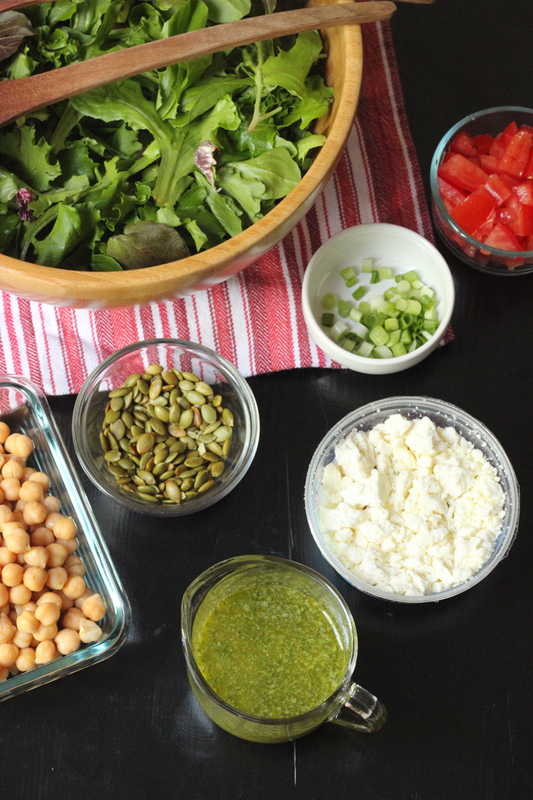 There are so many flavor combinations to dress up a salad, it’s difficult to be bored. If you’re bored with your salad, you’re doing something wrong. Last week we enjoyed this salad that hubs deemed, “Excellent.” I wouldn’t say that he’s hard to please, but an E is high praise, indeed. Makes my heart sing, actually. If this salad gets an excellent from someone who’s only warm to salads, imagine what it can do for you! Salads are not only a great food experience, but they are also a wonderful way to include fresh produce into your diet. You can sneak in certain veggies that might not fly on their own, but taste great in combination with other foods. 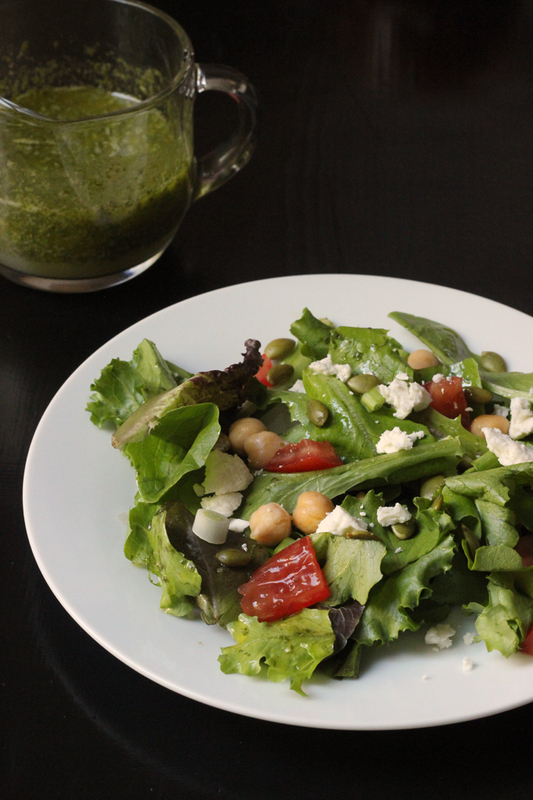 Spring Greens — Easy to come by during this time of year, early greens are tender and delicious. I buy an organic mix at Costco or ALDI for just a few dollars. I simply wash and spin dry in my salad spinner. Veggies — Tomatoes and green onion add flavor for very little cost. Protein — Garbanzo beans, aka Chick Peas, add nice texture and protein. 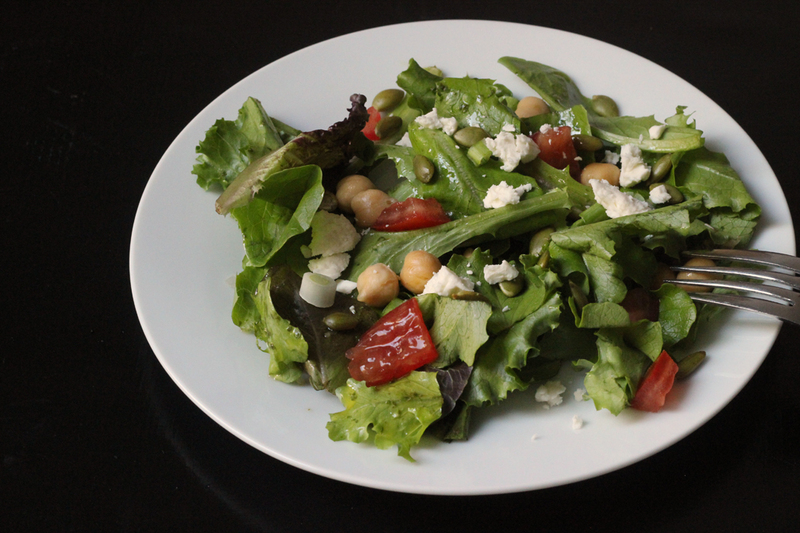 Cheese – Feta adds a salty contrast to the rest of the salad. Crunch — Pepitas, roasted pumpkin seeds, add a nut-free, gluten-free crunch, as well as protein and minerals. This salad is great on its own, but is tremendous when you add grilled chicken or shrimp. Stock up on ingredients when they are on sale. Instead of paying full price, buy more than you need when you see it on sale. Then you always have it when you want it. I do this for canned beans, pepitas, olive oil and bottled lime juice. It’s always nice to have a stockpile of that kind of stuff. Shop the stores that have the best prices. When I did my big grocery store showdown, I learned that ALDI and Costco have the best prices for a lot of the things I buy. You will naturally save money if you shop the best store for the items YOU buy. This may not be ALDI or Costco, so you’ll need to do your own price comparisons. The time investment as your research it is super valuable! Store your cilantro in a way that it doesn’t become a gooey mess in the veggie drawer. Go here for details. salad spinner – I love this one. pretty salad bowl – This one from IKEA is beautiful. citrus reamer – great for quick juicing projects. food processor or blender — to make the dressing. In a large salad bowl, toss the greens with enough dressing to coat. Place the lettuce on dinner plate(s). Arrange the other salad ingredients on the bed of greens. Pass extra dressing at serving. Originally posted April 4, 2011. Updated October 14, 2017. This looks delicious! I will make this as a celebration feast when winter is actually over here. We had snow last night! Snow! While it didn’t accumulate, it wa still a disappointment to see. Happy Spring! This looks SO YUMMY! I will definitely try it sometime soon. I think i have you to blame for my running to the store and buying lots of fresh cilantro last week. I’ve totally been craving some fresh, summery flavors and to me, this fits the bill. I am making that salad. It looks good at 9:30 p.m. right now. And I can’t wait to make that cilantro dressing-never tried it. Oh, I think I will try freezer cooking garbanzo beans. Hmmm…never done it. let me know if you have or is the cost difference worth it. I just bought a bag of garbanzos to give it another try. LOL I did it years ago and can’t remember why I gave it up. With the high price of canned — and how much I love garbanzo beans — it’s time to try it again. This looks and sounds believably delicious!!! I can never understand how someone can fail to enjoy something like this…………Salad is not JUST salad….salads can be taken in any direction!!! That is what is so great and limitless about them! They are exciting to combine and even more exciting to enjoy! I agree with your husband…a big, well-deserved E!!!!!!!!!!!!!!!!! looks SO yummy! the dressing sounds awesome! can’t wait to try, minus tomatoes of course! I love that dressing! Thanks! We have had this several times since you first posted it- it’s SOOO good! And now that my husband started P90X, this is a great salad that can fit into his diet AND be a meal that the kids can enjoy too! I’ll make this dressing soon–thanks. I love salads all the time. But I sort of disagree about the slow cooker–summer is a great time for the slow cooker since it doesn’t use a lot of power and it doesn’t heat up the house.